Starbarista recently caught up with Gimme! 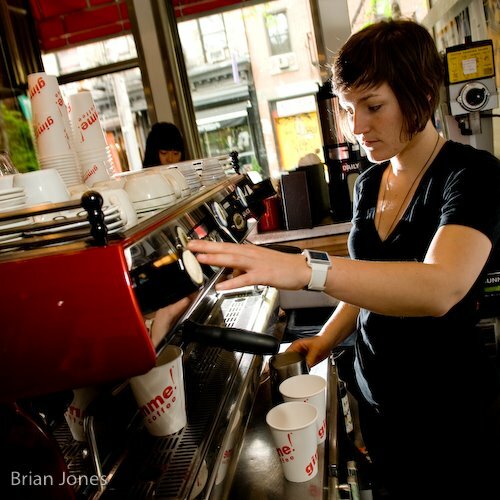 Coffee‘s Jenni Bryant at their recently-opened espresso bar in NYC’s NoLiTa neighbourhood. Gimme! started up in 2000 with a single espresso bar in Ithaca, upstate New York. They now have four shops in the Ithaca area as well as a roastery. In 2003 Gimme! made their first foray into NYC when they opened a location in Brooklyn’s trendy Williamsburg neighbourhood. In this podcast, Jenni talks about coffee and how it brings people together.